As an employee of a company, you may have access to a 401(k). A 401(k) is an employer-sponsored (offered) retirement plan that allows you to save money for retirement. Investing in mutual funds and ETFs (exchange traded funds) can be beneficial. Some of the advantages of investing in mutual funds or ETFs include instant diversification, economies of scale, professional management, and (generally) lower expenses. My advice to readers, particularly young readers, but even those with a long-time horizon for retirement is focus on the future, stick to your savings plan, and let your investments and compound interest work for you. In investing and finance, the words “beat the market” appear from time to time either as part of an investment strategy, conversation, or a combination of both. We tend to give volatility a bad rap – and rightfully so. Generally, the word is thrown at us during periods of when the market, and our investments, lose value. Volatility, however, works both ways. Teaching other insurance and financial professionals the fundamentals of insurance and investment planning, life insurance planning and taxation, prospecting, marketing, and ethics. We provide objective, comprehensive fee-only financial planning and investment advising. As fiduciaries, we have no product nor company to represent. We work in the best interests of our clients. We also provide tax planning and personal and business income tax returns. As Enrolled Agents with the IRS we are authorized to represent clients before the IRS regarding tax matters. Fields of study: Doctoral candidate in the doctoral program in financial and retirement planning. 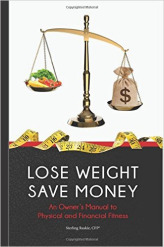 Lose Weight, Save Money is a guide to becoming physically and financially fit. The book takes you through the baby steps of healthy weight loss and fitness strategies and shows how to save and budget your money along the way. From choosing which foods are "free" and exercises requiring no gym membership to the concepts of fixing your credit and paying yourself first; Lose Weight, Save Money takes a practical approach to physical and financial fitness based on sound health and financial principles. The book takes a different approach by not having chapters, but headlines that lead the reader from one topic to the next.